SYDNEY (Reuters) – A drive-by shooting outside a nightclub in the Australian city of Melbourne inflicted “horrific injuries” that killed a security guard and wounded three men, police said on Sunday, but there was no suggestion yet that the attack was terror-related. I thought when you had a gun buy-back, the criminals turned them all in just like everyone else? I’m in favor of the right to bear arms, even though they don’t apply in Australia, but when making the argument against gun control being ineffective you must consider that the countries in this world aren’t completely isolated entities and the freedom one allows for firearm ownership can impact the ability for another to enforce a stricter control. Hold it right there. The reader David quotes has just run off the rails. It wasn’t intentional, there was no malice of forethought. But he’s off the rails nonetheless. This is a well done commentary by David and a heavily commented one. It’s worth your time to read it all, including the comments. David points out in his column that rights don’t come from the government, but I must emphasize that only by understanding that the very basis of your existence, and certainly of your rights, depends upon the only sovereign God in heaven, can one understand that gun control is wicked. At its root, gun control is usurpation, a replacement of man’s right with God’s right to dictate the terms of our existence. It is a corollary of what caused the fallen world to begin with, i.e., the man who would be like God. Writing on Facebook, Jefferies said he believes many people will argue that the hostage situation proves that gun control–of which Australia has plenty–does not stop criminals. But Jefferies believes the hostage situation proves just the opposite. I don’t know what the end result of this stand-off will be, but I do know this, he will only shoot that shotgun once before the police will be in there. This is a piss weak terrorist at best. If this had happened in the USA the guy would have semi automatic weapons and hand guns that could easily kill many people in a short period of time. It seems to me that gun control in Australia is working better than ever. And as for that one time, well, if it’s you I guess he’s sorry, but you’re not important enough for him to relinquish his collectivist views. To this Newsweek article, the comment thread is interesting. You can’t take people’s guns away if guns are still in the hands of others. I wonder what would have happened if someone had a gun in the purse or on their person. they would have been the first to die? Or increased the body count in the crossfire? Better to sacrifice one or two schmucks than to allow the whole lot of them to be killed , or so goes the thinking in Australia. Philip Alpers, a professor at the Sydney University School of Public Health, said that’s not likely to change. He said most Australians would still agree with Howard, the conservative former prime minister who instituted the gun laws. Mr. Alpers may be whistling past the grave yard if Australians want their country back and, but it remains to be seen. If he’s right, thus continues the enslavement of the Australians to their collective. Never underestimate the ability of the totalitarians to get slaves to advocate and go along with their captivity. SYDNEY, Australia — Armed police officers surrounded a cafe in Sydney’s central business district Monday morning after one or more gunmen took hostages and displayed a black flag with Arabic script in white in the cafe window. A police spokesman confirmed officers were called to the Lindt Chocolate Cafe, in Martin Place, a major shopping and pedestrian thoroughfare, at around 10 a.m.
A commercial television network, Channel Seven, which has a studio near the cafe, showed footage of people, wearing Lindt uniforms, pressed against the cafe windows, displaying the flag. Reports say anything from 20 to 40 or 50 people are being held. You mean that the police weren’t able to anticipate it and stop it before it happened? You mean the police being armed isn’t enough to keep people safe? You mean that there are 40-50 people now in Sydney, Australia who wish they were concealed handgun carriers? Tougher legal measures against people who supply illegal firearms have been announced by the SA Government. Attorney-General John Rau plans to extend measures he announced back in July, to include people complicit in firearms crime. Under previous plans, serious firearms offenders would face mandatory jail terms and there would be few circumstances where a sentence could be suspended. Mr Rau said the Government would now extend the measures to complicity. “This means anyone who sells or supplies an illegal firearm will be liable for any offence committed by the person to whom they provide the firearm,” he said. Mr Rau said the toughening of measures had been prompted by the murder of Adelaide teenager Lewis McPherson in 2012 and the recent jailing of the man who sold the gun to the killer. “The purpose of this of course is to make it very clear to those people who trade in firearms you are accountable for the harm that these illegal firearms are causing in our community,” he said. Judge Paul Muscat said guns should be totally banned to prevent them from falling into criminal hands. He said the 1996 guns buyback scheme in the wake of the the Port Arthur massacre had not removed illegal firearms from the community. “Our community now lives in fear of offenders armed with firearms. In the wrong hands, guns are deadly,” he said. He said most licensed gun owners took the responsibility seriously, but guns still had no place in a civilised society. “In my view, the possession of firearms serves absolutely no legitimate purpose in our society … people want guns, they do not need them,” he said. “Even a licensed firearm owner can misuse a gun under the wrong circumstances. They are human after all, prone to making errors of judgment. “The sooner firearms are totally banned, the better off our society will be. No-one should be able to keep guns at their home [as] many guns end up being stolen from licensed owners. Rather than go after the gangs and criminals who use firearms for harm, the law goes after anyone who sells guns, and don’t let this fool you. This means firearms dealers as well. This is what cowards do. They go after the peaceable rather than the violent. They are scared of the violent, so it’s easier for the bullies to beat up on the ones who won’t fight back. 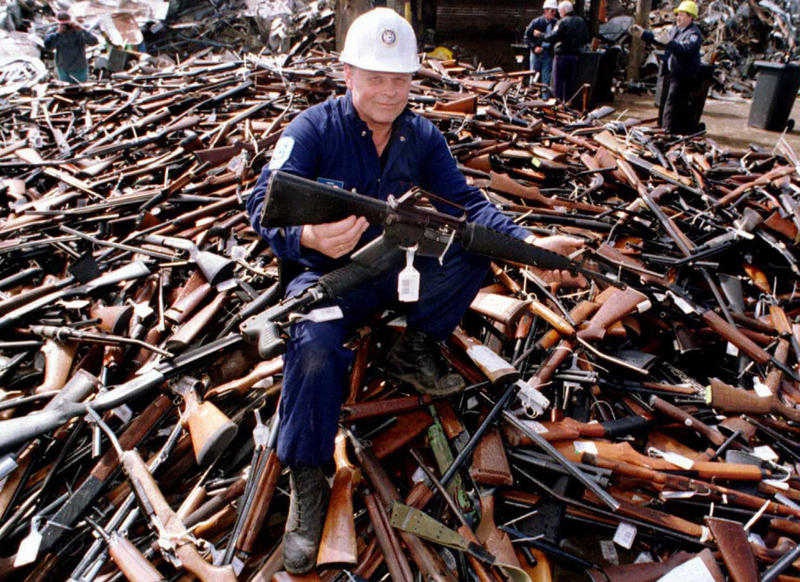 The Washington Post waxes poetic concerning the confiscation of guns in Australia … er … When Australians Gave Back Their Guns. When shootings occur in the United States, we Australians shake our heads. We do not have a Bill of Rights or a constitutional right to bear arms; here, the idea of ordinary citizens demanding to own guns without cause seems odd. So when one of our own is senselessly taken by boys who police said just wanted to be “Billy Bob Badasses,” it is aspecial affront. It’s not necessarily a logical one: Lane was shot with a small-caliber handgun. Plenty of handguns are still legally held in Australia. About a million guns have been imported since the buyback, bringing private gun ownership here back to roughly 1996 levels. But the real issue is availability. Here, those who are licensed to own pistols are not allowed to carry their guns. There are strict, police-supervised checks of storage and security of the firearms, and buyers must prove a “genuine reason” to own a gun. It has been estimated that if the United States had a buyback of similar proportions, about 90 million fewer guns would be circulating. Philip Alpers, an adjunct associate professor at the Sydney School of Public Health and a specialist in firearm injury prevention, has documented that after the laws were changed, the risk of an Australian being killed by a gun fell by more than 50 percent. Australia’s gun homicide rate, 0.13 per 100,000 people, according to GunPolicy.org, is a tiny fraction of that of the United States (3.6 per 100,000 people). It should be noted that our gun homicide rates were already in decline, but the gun laws accelerated that slide. In a 2010 paper, economists Andrew Leigh and Christine Neill found that the law change had led to a 65 percent decline in the rate of firearm suicides. Firearm homicides fell by 59 percent. Causality is, again, hotly contested. But what cannot be denied is that 17 years ago, after a brutal killing spree, Australia had a rare moment of national unity, with overwhelming public support and bipartisan agreement on a public health policy that has saved lives. A nation founded by convicts gave back their guns. Speaking for Bill Bob Badasses everywhere, I’d like to say it’s nice to know that Australia has become a veritable Shangri La. In more contemporary news, Sydney was the scene of a recent home invasion. Police are searching for up to 10 men who were armed with knives and guns when they broke into a home and assaulted a man in Sydney’s south. The victim, aged in his late 30s, suffered cuts to his head and was bleeding severely when emergency services arrived at his home on Minnesota Avenue in Riverwood on Tuesday night. A five-year-old boy and a woman who also were inside the home at the time were not injured, but are believed to have witnessed the assault. Police and paramedics were called to the home at 9.25pm after reports that up to 10 armed men had forced their way into the home and threatened the man with a gun. No shots were fired during the incident, but the man was severely beaten. The offenders, who were all wearing dark clothing, then left the home. Perhaps that was a part of Australia exempt from the gun control laws.